Find out what technology projects the organisation has taken on and is exploring. 2018 has been a year of technological breakthroughs and developments across the IT world. The highs of this period aren’t limited to the private sector. The Australian Institute of Health & Welfare has had its share of big wins, challenges, and is ready for more digital transformation in the new year. 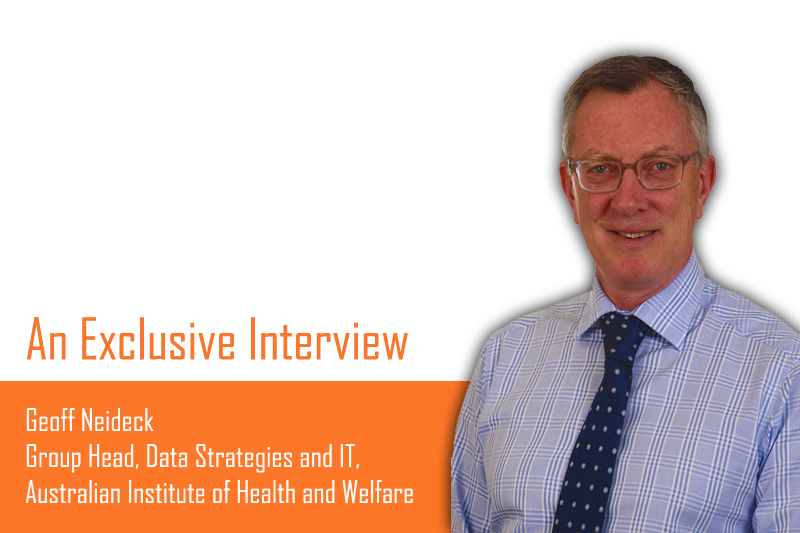 OpenGov Asia had a chance to speak to Geoff Neideck, Group Head, Data Strategies and IT, Australian Institute of Health and Welfare. In what he calls, “a very interesting role”, he gives us an inside look as to how his organisation has progressed and where they are investing in for 2019. Geoff describes the Australian Institute of Health and Welfare as a major information and data agency. Housing a repository of data, it helps stakeholders get a national picture of health and welfare issues and topics. Government, researchers, policymakers and the community can access the information to inform themselves about healthcare and welfare issues, as well as start a conversation around the data. As Group Head, Geoff has the combined duties of a Chief Data Officer and a Chief Information Officer. Hence, he oversees the organisation’s IT functions as well as its data strategies to support the needs of itself and its many stakeholders. With such a dynamic role, it comes as no surprise that the Institute has a good number of technology projects under its belt. Although many are a work in progress, Geoff begins by sharing a meaningful one – the Veterans’ Health and Welfare Program. Between 2017-2018, Australia’s Department of Veteran Affairs reported that mental health and suicide prevention ranked high on its list of priorities. Monies were pledged to improve the delivery of mental health support to the overall welfare of veterans and ex-personnel through a series of policies. The data linked and analysed by the Australian Institute of Health and Welfare will provide tangible benefits for the veteran community. The tool generates reports and diagnostics to make improvements to the dataset. Using the information provided, quality information can be used in tandem with the commentary the agency publishes in their reports. “In the same sphere, we are also looking at applying machine learning techniques at the point of integrating data into the organisation, and validating and preparing it for analysis,” Geoff shares. Its application is to assist in the process of cleaning the huge sets of data. The machine learning aims to identify duplicate records, gaps in the data, and provide diagnostic information. Any manipulation which needs to be done will help improve the quality of data for research and government policy analysis. However, the Australian Institute of Health & Welfare does not do the heavy lifting alone. The size of the organisation is a constraint on the number of experienced staff it can retain. Other agencies, such as the Australian Bureau of Statistics, and consultants collaborate with them to provide assistance to projects his team undertakes. Presently, they are recruiting individuals with advanced data science skills to support the multiple projects they are undertaking. This leads us nicely to what Geoff thinks is one of the biggest challenges the Australian Institute of Health and Welfare faces – plugging a talent gap. “It’s quite a challenge finding the right people with the skills and techniques we need. Particularly, getting people who have applied techniques in the area we are in – government administrative and statistical data,” explains Geoff. Generally, people who have good data science skills would make the cut. However, what his agency is really looking for are people with a healthcare or administrative data background. Like other organisations in the public sector, data governance and security are a major challenge his organisation wrestles with, but ones in which they have over 30 years’ experience in. Geoff is cognisant that Australian citizens need to be assured that their data is used well through his organisation’s statistical collection and analysis. The goals of policy must be achieved while protecting the interest of citizens. It is a fine balanced which must be struck. In the horizons, the agency is working on a cloud strategy. For now, some activities have already been moved to the cloud, such as certain outward facing work, says Geoff. Some development work is also cloud-based. “But we’re looking at other activities we can put into the cloud. We’re working in line with the Australian Government policy around public data and deployment into the cloud,” shared Geoff. Another project they are looking at is the nature of accessing data. Geoff says the way people want to see data is changing. Traditionally, hardcopy publications with tables and graphs were the norm of this agency. Moving forward, Geoff and his team are looking at considerably more web-based output. Hence, data visualisation will become more important for his team. Apart from acquiring the tools from Tableau, they are grooming the necessary talents to apply the technology. Close to 200 of their staff have been actively using data visualisation in their reports. Already, more than a thousand visualisation dashboards are available on their website. However, he believes more can be done to democratise the access of the agency’s valuable data. In the year to come, Geoff and his team will continue to work closely with other government agencies to bounce ideas, tap on their experience, and deliver better results for the Australian community.